The day started abruptly with the sound of a phone ringing. It was the hotel staff kindly informing us that our bill was 'ready' to be paid. We then got picked up by Cecile, who took us to our new fabulous apartment in BANANI where we are currently residing. It has everything we ever dreamed of and more; black shampoo, as much water as we can drink, a cow painted on the wall, and wireless internet! Also, we have adopted a new member of UE Bangladesh; he's from Barguna, the prime area struck by cyclone Sidr. His name is Nasreen and he comes with the apartment. After this we proceeded to get local. As true Bengali fashionists we didn't have to look long to find nice things, even in our freakishly large sizes. The staff of the shops were refreshingly honest and blatantly told us when we looked ridiculous. Also, we are not allowed to wear our lunghis on the street because we'll get laughed at... Nasreen laughed anyway. We also invested in some quality music. 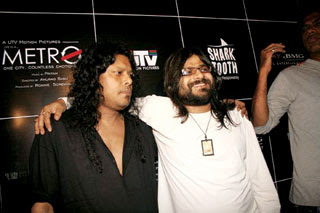 Everyone should download Shahid's music legally (rather than our illegally copied cd) from www.amadergaan.com. We blasted his tunes through our apartment. Nasreem was disappointed with our taste. He likes James (left). It was nearing Bangla weekend (Friday to Saturday) and it seems universal that people try to escape their offices early. However, we managed call our ITC contact just as he was leaving, and he agreed to meet with us. He is a senior GIS and data administrator and has established contacts with officials in Chittagong Planning Development Agency and the University of Khulna Planning Department. Another thing we noticed is that everyone here seems to have a card... even pharmacies! We have collected an impressive amount of them and are inspired to make our own. So... we have an early start full of architecture tomorrow, we're joining the Urban Study Group in a 4 (!) hour walk through Dhaka starting at 8 (!) in the morning. We feel like we're off to a kick start and Bangladesh has been smiling at us. However, something we have found is that it is very hard to ignore all the beggars on the street. There are just so many, and it is very saddening... We developed a strategy to at least give the children cookies instead of money, so far the rickshaw wallahs have been more keen on the cookies than the children.